It’s Wedding Week here at Vinspire HQ, and there’ll be lots of memorable marital ideas to get those party planners prepping. I, however, do not foresee any proposals; I can’t hear those bells chiming, I have a wedding-less summer schedule ahead, and I’m probably past my bridesmaid’s best. So, to avoid all the serious stuff – the things that could make or break the big day – I’ve chosen to do more of a covert feature; hip flasks. 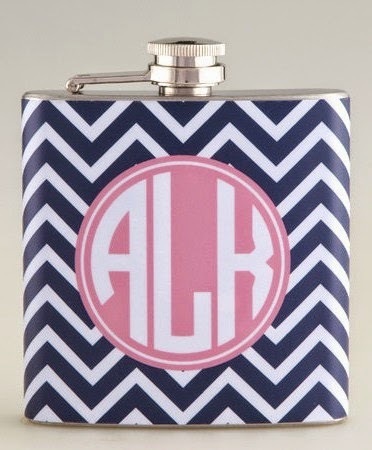 I’ve scoured the internet for some snazzy flasks that could be given as presents for the bride and groom/best man/bridesmaids/ushers, etc (not your typical plain silver, engraved kinda ones). Or maybe they could be for stag do’s or hen nights; boozing is pretty essential there. 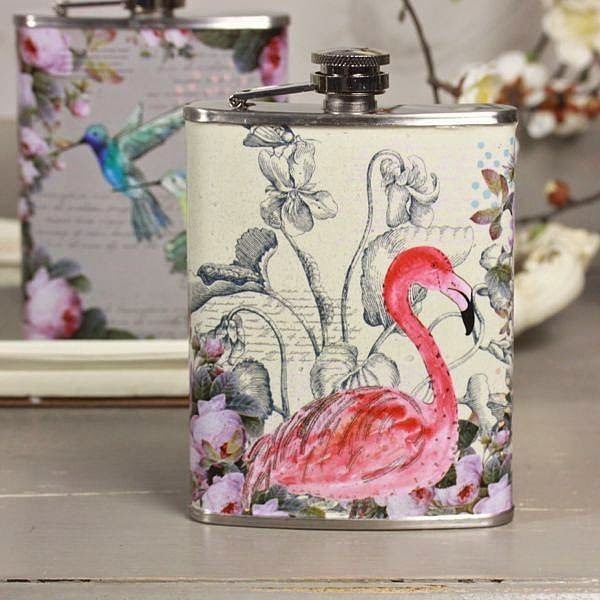 Or you might just want to purchase a decent hip flask for your own use; weddings can get bloody expensive, so sneaking your own supply in will help save your wallet/purse from being rinsed. Let’s start off with SWIG®. 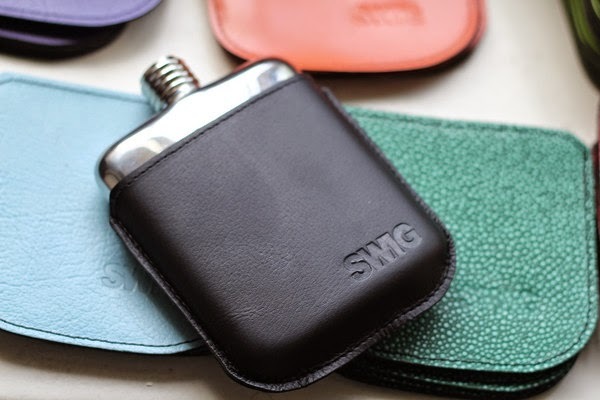 Established in September 2013, British company SWIG® have created a unique 170ml seamless stainless steel hip flask, which is customisable with different coloured leather pouches; you will never get bored! The flask itself is £24, whilst pouches range from £10 for the most basic, to around £60 for limited edition illustrated ones. Every Flask arrives with the owners unique SWIG® Society membership ID engraved on it's shoulder. A society you say? Yep. Your flask acts as a membership card, and being a member not only makes you super cool, but it entitles you to a free pouch (delivery TBA), an invitation to the annual SWIG® Society party, and there’s a potential promise for monthly SWIG® whisky refills. If that’s not tempting enough, every flask also comes beautifully gift packaged, so if you don’t end up keeping it for yourself, it would make an ACE present. 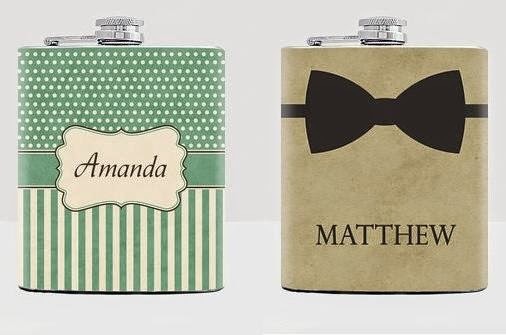 Next, we have the personalised named hip flasks, which would be ideal for handing out to bridesmaids and ushers, etc. These come from Fantasticum on Etsy, both priced at £11.45. The guy’s bowtie flask is a straightforward, classic, which would no doubt please any gent. And the same goes for the stripy/spotty ladies one; it’s not OTT even with the mint green, candy shop stripes; I’m saying its retro chic. There are plenty of other options on Fantasticum’s online shop, if these don’t float your boat, and if you buy three, you get the fourth free! 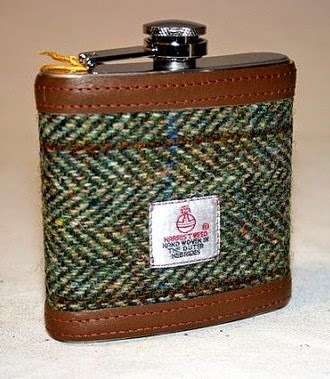 Harris Tweed in hip flask form is an ideal gift ‘For Him’; the Scottish woven beauts available from Ten10Creations are timeless. Finished with quality hand cut real leather trim, and sporting an authentic Harris Tweed label, all you need to top off the look is a hunting jacket, a pair of wellies and the great outdoors. At £25, this flask comes in a black satin lined presentation box and includes a handy little funnel. ‘For Her’, I’ve found this floral flamingo number. Did you know that a group of flamingos are called a flamboyance? Isn’t that the BEST name? Anyway, this comes from Lisa Angel Homeware and Gifts on Not On The High Street priced at £19. Lovely. 1// Choose a pattern (there are stripes, spots, checks, animal prints, and more). 2// Choose a pattern colour. 3// Choose a frame to go in the centre. 4// Choose a frame colour. 5// Choose a monogram font style. 6// Input your initials (or whoever’s initials the flask is for). Hey presto! For £10.38 (minus shipping) and a wait of 2-3 weeks, you can get your hands on a drinking vessel that is completely tailored to suit you. The idea of a monogram makes this perfect wedding present material for some young newlyweds; it’s personal and no one else would have one the same. There really are so many options out there, but hopefully these have given you enough flask-spiration. Have you seen any awesome ‘His & Hers Hip Flasks’? Have you given, or been given, gifts like this at a wedding before? We’d love to know! personalised wedding gifts is an exclusive online gifting experience specialising in luxuriously packaged gift boxes containing high quality intimate apparel including lingerie.